Both Alison and Autumn have shared two lovely projects with these goodies and here is what I put together with what has to be my favourite ever travel bag! I decided to use some chipboard pieces from a Tando kit and liked the idea of layering the smaller arches onto the larger one. I glued everything together before I started, which was a big mistake! 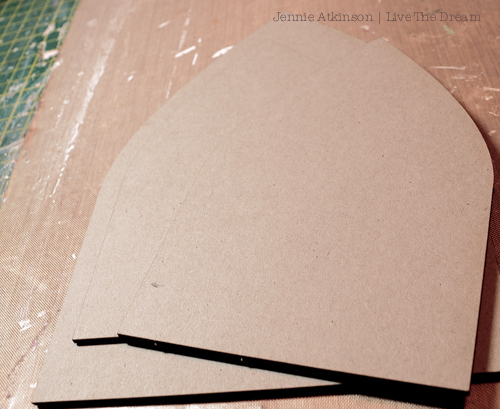 as I then couldn't get my planned texture paste to run from the inner arch to the outer arch, so I had to start thinking again about how I was going to add my texture! I am afraid that there are no pictures of the actual process of getting to this stage - I thought I had taken some, but I must have got completely carried away! 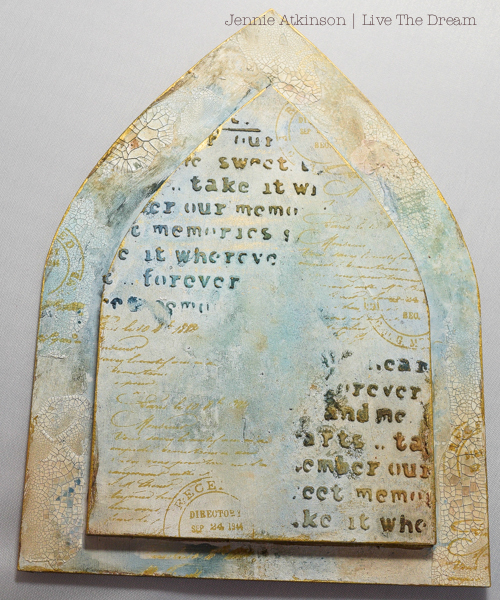 I gave everything a good coat of gesso before using my texture paste on the inner arches and then some crackle paste around the edges of the outer arch. Once this was dry I sprayed here and there with Broken China, Faded Jeans and Vintage Photo Distress Spray Inks adding a lot of water to get these lighter colours. However, I did allow it to puddle on the texture paste. 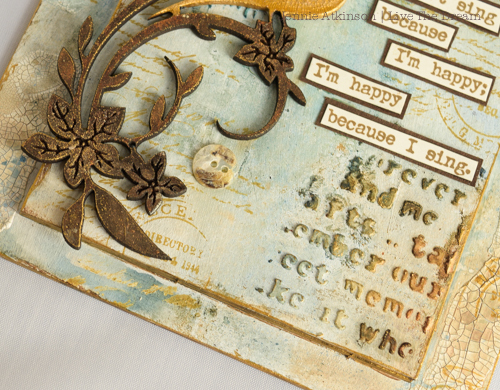 Finally I added some stamping using brown Archival ink. I thought the edges needed a little definition so used my gold pen and also rubbed a little gold wax here and there on the texture paste. I love this wooden bird and greenery flourish from Calico Craft Parts and thought he would look good on my background. I stippled two colours of brown paint here and there on the greenery with a stiff paintbrush and once it dried I was able to add a little gold wax. And the wonderful bird (I am not sure what sort!) got painted gold and crackled. 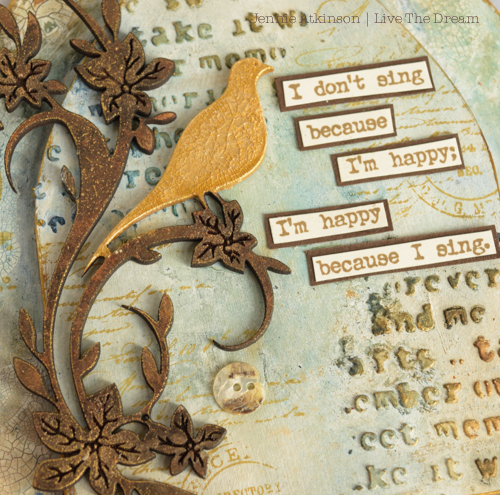 I added more stamping using this lovely quote from fellow Creative Guide Alison Bombers set of wonderful quotes about silence and singing (PaperArtsy EAB03). This is quite a different piece for me (no flowers!!) and I have really enjoyed putting it together and creating the background despite making the mistake of sticking it together at the beginning. As a result it is a totally different project to one that I had in mind to make! Thank you for joining me today and have a great week! Love these gorgeous musical arches. 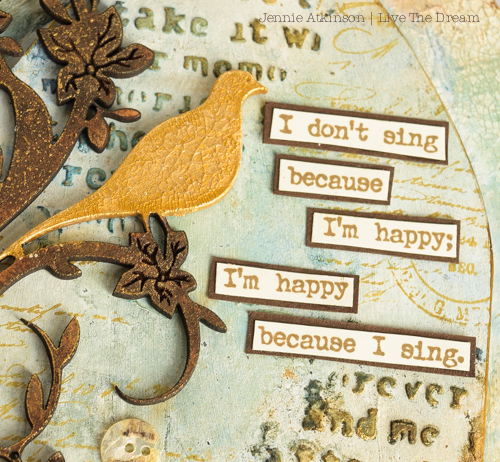 The bird is beautiful in golden crackle, and I just love all the layers in the background, especially that textured text - and lovely words too, of course! A beauty. Stunning as always! I love your delicate colors and touch of gold. The crackle is just enough and your greenery is the icing on the cake! Truly beautiful! Such a stunning project Jennie and great use of the travel bag contents. 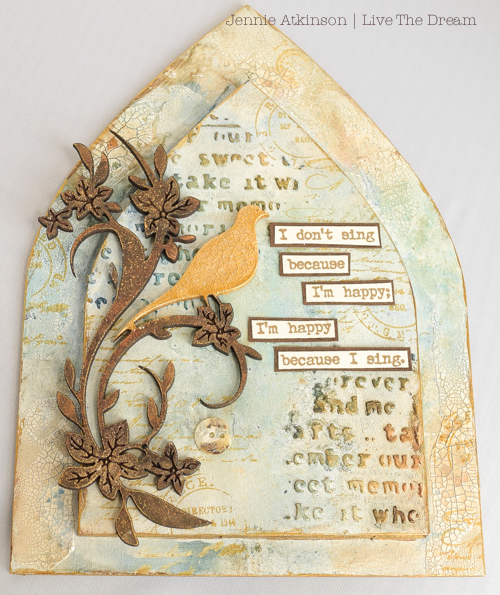 Love the depth of the arches, textures and sentiment. The bird and flourish are the perfect finishing touch. Oh what a lovely Vintage piece. This soft light Blue with a bit Brown and Gold looks so nice. Also good is the three dimensional look with the two bows. I like it much. 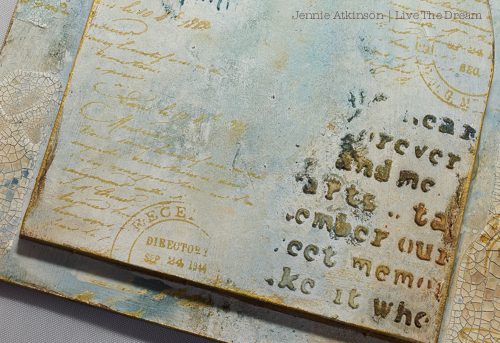 Love the soft shabby feel of this Jennie! The letters look fantastic done like that, the whole projects is so pretty! Lovely quote too! Super use of the travelbag items! Gorgeous piece and the wonderful quote ties everything together so nicely! So glad I'm not the only one who forgets to take process photos! So so beautiful! Jennie. Design and execution are, as always, spot on. Such an elegant piece of art you have created using the contents of the travel bag . I love the delicacy of the colors of this project, I like the crackle parts and the embossed lettering, it's all enchanting and harmonious.